The GPD MicroPC is a handheld computer with an unusual design, an affordable price tag, and surprisingly decent performance. GPD unveiled the tiny computer late last year, showed it off at CES, and the company plans to launch an Indiegogo campaign for the MicroPC on February 15th. Backers will be able to pick one up for $299, which is said to be $100 off the retail price. That makes the MicroPC GPD’s cheapest handheld computer to date. But it’s also a brand new form factor for the company and the first model with an Intel Celeron N4100 Gemini Lake processor. So is it worth spending money on? GPD sent me a pre-release unit so I could find out. So far I’m going to say it’s a definite maybe — the MicroPC is fast enough to handle most basic computing tasks. But its unique design makes it tough to use the same way you would a laptop, tablet, or smartphone. The MicroPC is definitely its own beast. I’ll have a more detailed review soon, but in this article I mostly wanted to take a look at some benchmarks to give you an idea of what kind of performance to expect. Before we get to that though, I should probably explain what the MicroPC is. It’s a tiny computer that weighs just under a pound and which measures about 6″ x 4.4″ x 0.9″ with the lid closed. Open it up and you’ll be looking at a 6 inch, 1280 x 720 pixel display. It’s not a touchscreen. Instead there’s a small laptop-style touchpad above the upper right corner of the backlit keyboard and two buttons (left and right) on the left side. If you hold the computer in two hands it’s pretty easy to swipe your right thumb across the touchpad and use your left thumbs to click. Or you can rest the computer flat on a table and use two-finger gestures on the touchpad to scroll, right-click, and perform other actions. The keyboard itself is more like the old-school thumb keyboards you used to find on smartphones than a laptop keyboard. Since there’s not a lot of space for all the keys, GPD tried to cram in a lot of Fn keys. Pressing Fn + U or I will adjust the display brightness, for example. And you have to hit Fn + O or P to enter apostrophe or quotation mark characters. It can take a while to get used to some of those key combinations. I took an online typing test and found that I could hammer out about 31 words per minute using my thumbs, or about 35 words per minute when the computer was flat on a table and I was using three or four fingers instead of two… but the keys are too small to comfortably fit all ten of my fingers over the surface. For the sake of comparison, I can usually hit 80 to 100 words per minute when using a full-sized keyboard, or about 40 words per minute when typing with a virtual keyboard on my smartphone. Your results may vary — I was never a huge fan of physical keyboards on phones, but folks who cut their teeth on BlackBerry products may find the MicroPC easier to type on than an iPhone or modern Android device. There are two other things you’ll notice above the keyboard: a power button and a fan switch that you can use to silence the fan (and reduce performance a bit) or to turn the fan on when you want the benefits of active cooling. While there’s no webcam, the MicroPC does have a microphone so you can use it to record voice notes or make voice calls using Skype or other VoIP apps. There’s also an audio jack on the front of the computer and a speaker on the bottom. On the left side of the computer there’s a microSD port and USB 3.0 port and on the back there are two more, along with a USB Type-C port (for charging and data), a Gigabit Ethernet jack, an HDMI port, and an RS-232 Serial port. That last port helps explain at least part of the target audience for this device. While I don’t have any real use for it, IT administrators and other tech workers can use the port to connect to networking gear and other equipment quickly and easily, making this a compact travel companion that you can use to do some quick debugging on the go. But the MicroPC also works pretty well for some general-purpose computing. It has an Intel Celeron N4100 quad-core processor, 4GB of LPDDR4 RAM, and a 128GB M.2 solid state drive as well as support for 802.11ac WiFi and Bluetooth 4.2. And the computer ships with Windows 10 Pro. You can’t upgrade the RAM, but you could replace the SSD with a larger one if necessary. Intel’s Celeron N4100 isn’t exactly a powerhouse, but I had no difficulty using the computer to surf the web, do some writing, or even play some (not particularly demanding) games. The processor is a quad-core chip without support for hyperthreading, so you get four cores and four process threads. It features Intel UHD 600 graphics. GPD also seems to have done a pretty good job with cooling: I ran some pretty demanding benchmarks on the system and it didn’t get all that hot, and performance didn’t drop significantly over time. Of course, that’s with the fan enabled. It’s not super-noisy, but it is audible. If you turn off the fan, you may feel the computer getting a little warmer over time, and that may cause some CPU throttling to kick in. For the purposes of these tests, I tried to compare the MicroPC to other handheld computers I’ve used over the past year, including the One Mix Yoga, One Mix 2S Yoga, GPD Pocket 2, GPD Win 2, and TopJoy Falcon. Unfortunately I only recently started using GeekBench and Cinemark in my tests, so I don’t have scores for every device. Still, it should probably come as no surprise that the only computer that the MicroPC consistently outperformed was the One Mix Yoga, which not only has an objectively less powerful processor, but which was pretty sluggish even by Atom x5-Z8350 standards. What may be surprising is how slim the differences are between this computer and some that cost substantially more. In Cinebench, for example, the MicroPC has a multi-core score of 238, while the One Mix 2S Yoga with an Intel Core m3-8100Y processor only scores 241, despite selling for around twice the price. The One Mix 2S Yoga does better in Cinebench’s OpenGL graphics test and its single-core CPU test. But still, the multi-core performance of both machines is pretty similar. And as I mentioned, the MicroPC doesn’t feel slow when you’re using it for web browsing, light gaming (of the point-and-click variety, for example), or other simple tasks like watching videos. Another thing I should point out: the benchmark scores listed above were all run after installing a BIOS update that increases the TDP of the computer’s Celeron N4100 processor from 6 watts to 10 watts. Still, I did run some tests before updating, so let’s take a look at them. As expected, increasing the TDP led to a substantial performance boost in most tests. The computer didn’t score all that much higher in GeekBench after updating from 6 watts to 10 watts, but Cinebench results went up by quite a bit, as did 3DMark graphics test results. I haven’t extensively tested battery life after applying the update yet, but I’ve heard from other testers that they were getting around 4 hours of battery life while using the GPD MicroPC with the 6 watt BIOS, and that they’ve seen it go down a bit after updating. GPD, meanwhile, says that in their own tests there’s minimal impact on battery life when doing things like watching videos… but you will definitely see much shorter battery life when running games or other resource-intensive tasks. I still want to spend a little more time using the MicroPC before publishing a full review. I want to have more to say about battery life, the typing experience, and who might want to spend $299 (or more) on this sort of device. But I can say right now that it can be frustrating to use in some situations (typing an article for Liliputing took me about three times longer than normal), while a pleasure to use in others (it does make a nice little handheld video player or game system — and I suspect IT folks who just need to type in a few commands at a time might love it). I can already tell you that at the moment it has limited support for running GNU/Linux distributions. I tried a few different options and some wouldn’t boot at all, while others didn’t recognize the screen orientation, so I found myself looking at a sideways user interface with no obvious way to rotate it (the usual “xrandr -o right” command didn’t work). For now the easiest way to use Linux tools on the GPD MicroPC is to enable the Windows Subsystem for Linux, install a Linux distro from the Microsoft Store, and use command line utilities. But from what I hear there’s already work underway to get Ubuntu up and running on the MicroPC. In fact, GPD has already listed Ubuntu MATE 18.10 as one of the supported operating systems on a preview version of its crowdfunding campaign (although that page may change before the campaign goes live on February 15th. Does this thing have a TPM chip? I’m interested whether you can have BitLocker on it since it’s too portable to not to encrypt the data on it. Looks like Bitlocker encryption is an option — I haven’t enabled it yet, but Windows lets me start the process of encrypting the drive. I see, thank you. 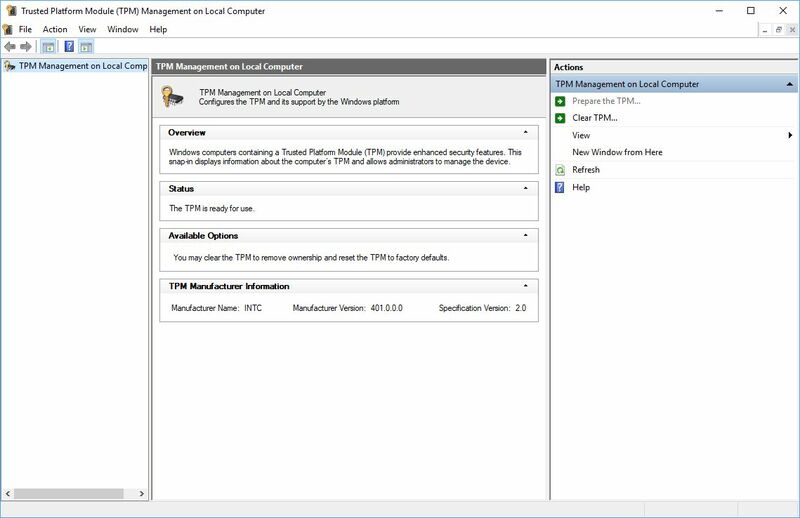 Do you mind screenshotting tpm.msc (Win + R, “tpm.msc”, Enter)?